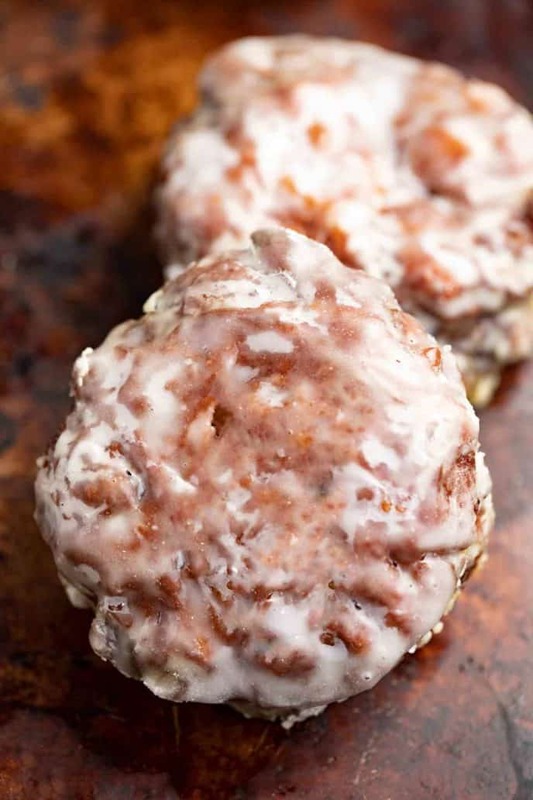 Apple Fritters are light and fluffy, filled with chunks of apples, swirled with cinnamon and glazed in a perfect sweet powdered sugar glaze. 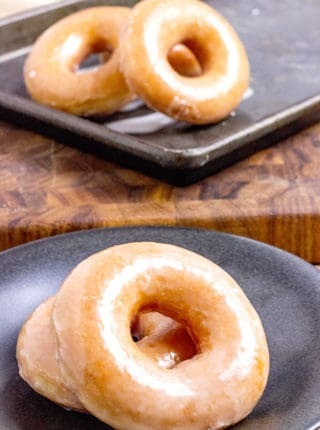 We love donuts, in fact our Krispy Kreme copycat is one of the most popular breakfast recipes on the site! 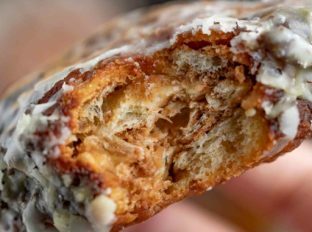 When I posted Apple Fritter Bread a couple months ago I had no idea it would be so incredibly popular, but a number of readers reached out to me asking me for a Classic Apple Fritter Recipe! This is it! 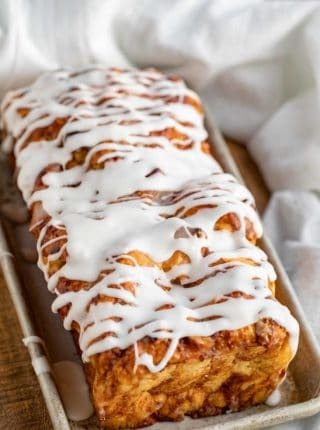 One of my favorite things about this recipe is the cinnamon swirl. A local donut shop near me makes their Apple Fritters this way and it inspired me to do the same. I used to add the ground cinnamon to the batter and whisk it in, but by keeping it in streaks it makes it more flavorful throughout. 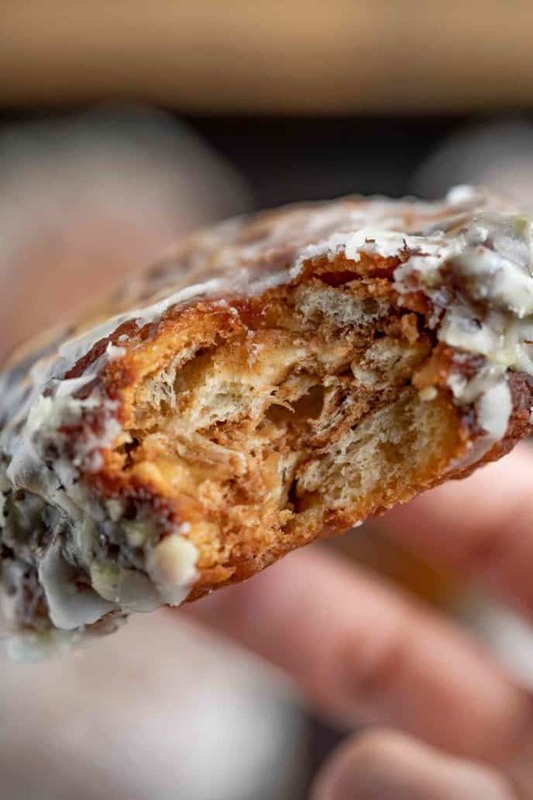 This All-American recipe for yummy apple fritters is like taking the best parts of apple pie and donuts and combining them in one. The recipe is so easy too you don’t need a stand mixer or to proof your dough or use any yeast like you would in a classic donut recipe. The batter is simple enough to mix and it makes the absolute best apple fritters, hands down. I promise. Keep your oil temperature at 350 degrees, 375 will leave them raw in the middle. Try to pour the batter as flat as possible, it will puff out a lot, I pour it in a circle into the oil. Fry until just golden brown before flipping, on such a high heat if you wait even a bit too long they’ll get too dark. Cut the apples very small. You can use fuji or granny smith apples, granny smith will make the fritters more sweet and sour. To add more flavor to glaze you can add vanilla extract. Dip the fritters in glaze while just barely warm, if too hot the glaze will melt off. 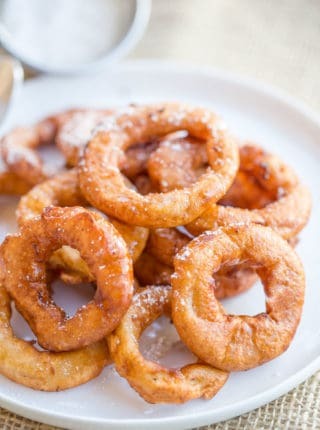 Be careful when deep-frying, oil can splatter if you drop the apple fritters. Use a slotted spoon to remove the fritters for safety and to drain easily. Do not cool on paper towels, use metal cooling racks to prevent them from steaming. If you want to skip the glaze you can toss in cinnamon sugar instead. 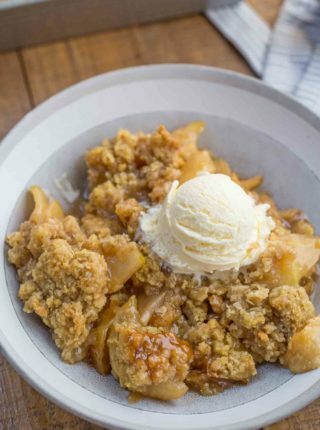 Use only fresh apples for the filling, canned apple filling it too moist. Whisk together and set aside in a large bowl until fritters are done frying. In a large dutch oven using a candy thermometer as a guide heat 4 inches of vegetable oil to 350 degrees. In a large bowl mix together the flour, sugar, baking powder and salt. Whisk in the milk, eggs, oil and apple chunks then dust on the cinnamon and swirl it into the batter. Using a 1/4 cup scoop, scoop four apple fritters into the oil per batch and let them cook for 3-4 minutes per side, then remove with a slotted spatula. Mix together the powdered sugar, milk and corn syrup then microwave for 20-30 seconds and dip the fritters into the glaze on both sides. My mouth is watering just reading this! I can’t wait to try these! Love it! I hope you enjoy them. Apple fritter is my weakness! I am going to try making this as soon as I come home from camping! Hands down, this is easily a favorite treat of mine! These look lovely; excited to try your recipe! What a delicious dessert! Like something you’d find at a fair – can’t wait to give it a try! They really are a great treat. These are always gone so fast! They are everyone’s favorite! Glad I can make them at home! I’m so glad you all love them. Oh wow these are calling my name!